Revolver Revolver has some shiny new stationery to celebrate our Business Quest 2010 win. Printed at A14 in Nottingham, we’ve used one or two traditional methods to give the company a more sophisticated feel. Using GFSmith board at a whopping 700gsm and keeping the design simple, the result is stunning. 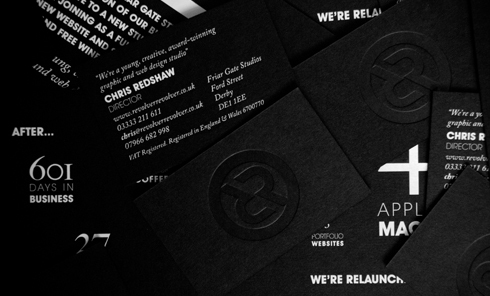 A14 also produced our invitation cards for our Relaunch event, happening on Tuesday May 11th at Friar Gate Studios at 18:00. We hope to see you there!